Why choose the 2019 Chevrolet Equinox? Get this five-passenger compact crossover because you're planning some sporty off-road adventures. With its optional all-wheel drive, diesel power, and towing capabilities, the Equinox is ready for action. Alternatively, you can get the Equinox because you spend your week crawling through rush-hour traffic and scouring city blocks for parallel parking spaces. This compact crossover is easy to handle in a tight spot and its diesel engine makes the Equinox especially fuel-efficient. What are the 2019 Chevrolet Equinox trim levels? Choose from four Equinox trims-the entry-level L, affordable LS, nicely equipped LT, and stylish Premier. Each model is roomy and comfy, seating up to five passengers in style. The L is custom-order only, so you won't find one at your local dealership. What you will find is the mid-range LS, which is loaded with a long list of tech features. The Equinox LS has got everything from a Wi-Fi hotspot to Apple CarPlay and Android Auto smartphone integration, so it's unlikely that you'll ever miss an important text or email. The LS also comes with Chevy's OnStar telematics system, safety gear that sends help after an accident or unexpected breakdown. And, unlike the custom-order L, the LS adds a spare tire and tire jack, which are bound to come in handy at some point. With the mid-grade LT, you're looking at a seriously long list of comforts, conveniences, and options. For instance, the upgraded infotainment display makes it less likely that you'll fat-finger the wrong app. The power driver's seat helps you find that just-right spot at the wheel. Options like the Infotainment package let you outfit your LT with the features you crave. The top-of-the-line Equinox Premier is fully loaded with upscale goodies. That means ambient interior lighting and perforated leather upholstery. Everyone can see the Premier coming too, thanks to its LED headlights and taillights and chrome exterior trim. Is the 2019 Chevrolet Equinox AWD or 4WD? When you need a little extra traction for your daily drive-whether you're facing icy streets or dirt roads-you can always add all-wheel drive to your Equinox. This performance gear is always ready to jump into action, automatically sending power to the rear wheels when there's slippage. What's the 2019 Chevrolet Equinox diesel engine? Among the three Equinox engine options, you'll find a 1.6-liter diesel engine designed to make your commute nice and thrifty. Both the front- and all-wheel-drive Equinox models with this engine are EPA-rated for 28 city/39 highway mpg. 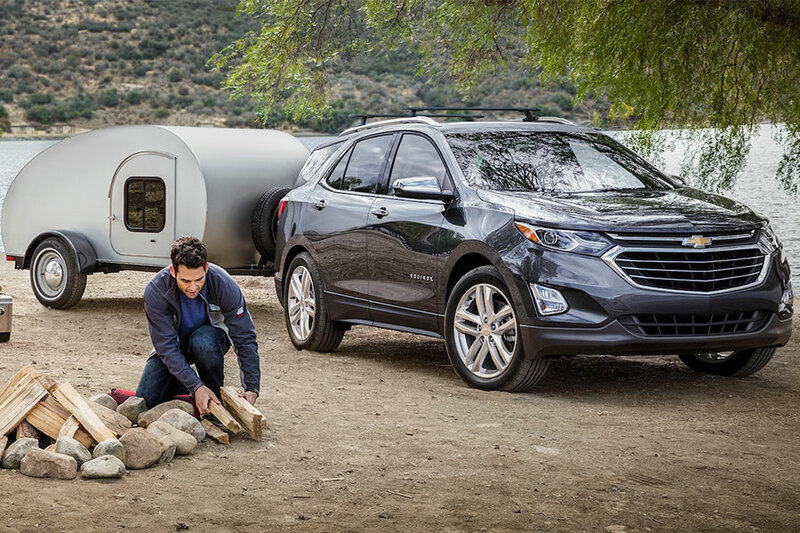 What's the 2019 Chevrolet Equinox towing capacity? The answer to this question depends on what's under your Equinox hood. With the turbo 1.5-liter four-cylinder or 1.6-liter diesel engine, this crossover can tow up to 1,500 pounds. But, with the turbocharged 2.0-liter four-cylinder engine and the proper equipment, the Equinox tows max loads of 3,500 pounds. This little crossover can haul his-and-hers Jet Skis across town, no problem.